KayKiSpeaks.com: Lets Call This the Toya Carter Takeover! One thing that youve consistently hit me up about is a woman who "claims to be Wayne's real first love or whatever". Which these days is not hard to do. Def dont want yall to think Im ignoring your emails.. I just dont wish to entertain the negative when Toya has SO much going on thats positive. For starters, she is everywhere & I have a feeling that she's just getting started. 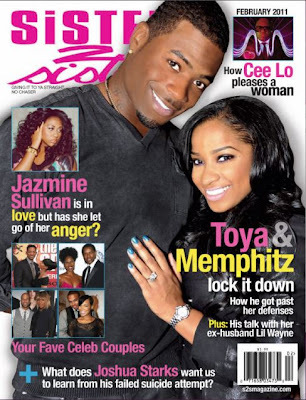 Her boutique opened a few months ago in New Orleans, she and fiance Memphitz are on the cover of S2S Magazine, where she talks about what its like being with him. The promo for new show, Family Affair just hit airwaves. She's about to release her book, Priceless Inspiration, I mean, your girl is going all sorts of hard! And I commend that. So, here is the S2S cover & the promo from her new show! She looks gorge on both & the energy of the promo is crazy right.. can you say fierce!? Not much, but I hope this will suffice! Im sure she'll have something else for me to share tomorrow! YES tHnK yu! TOYA is a BOSS CHICK!